But I never finished telling you about Mike Torrez. That’s my tribute to the first sentence of the Denis Johnson story, “The Other Man,” which begins “But I never finished telling you about the two men.” It is one of my favorite first sentences. It works in the context of a standalone story as a disorienting, alluring first line, speaking of the inability of anything to be fully said or known, and it works in the context of Johnson’s book of linked short stories, Jesus’ Son, as a way not only to loop the story back to an earlier story (“The Two Men”) but to communicate that this fractured life is all one song, strung together imperfectly through digressions and obsessions and compulsions and associations and the meandering hunger of the disintegrating mind. Everything is woven haphazardly into a uniform of strange design. I never finished telling you about anything. I never will. 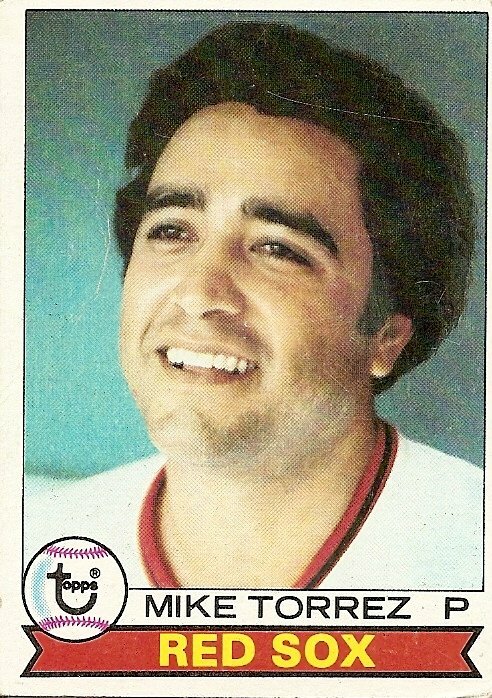 Since his appearance as an Expo in perfect balance in his 1974 card, Mike Torrez has grown a mustache. Perhaps this is an attempt on his part to exert some control over concrete reality amid the constantly changing particulars of his existence. He has been in constant motion. From December of 1974 to November of 1977, less than three full years, he has gone from the Expos to the Orioles to the A’s to the Yankees and finally to the team referred to on the front of this card clumsily and flimsily with some rushed goopy paint, the sloppy attention to the finer elements of design leaving some equivocation about the pitcher’s current whereabouts. I never finished telling you about Juan Epstein. Several days ago, when I’m sure I should have been doing something else, I was meandering around in the Google newspaper archives, looking through articles in scanned 1970s newsprint for traces of Robert Hegyes, the recently deceased actor who played Juan Epstein on Welcome Back, Kotter. I found a favorable review of an episode of Welcome Back, Kotter set to air that night, October 2, 1978. I know that date. Of all the days I could have walked into in all the scanned newspapers in all the world . . . The flickering signs of promise in the stats on the back of Mike Torrez’ 1974 card have bloomed on the back of his 1978 card into robust testaments to stardom, namely 68 wins in 4 years, a borderline-ace average of 17 per year. Constant motion has not adversely affected performance, Torrez apparently possessed with phenomenal focus, impervious to the intimations of transience and disappearance all around him. I’m sure I was glad to find him in a pack, glad to see that he seemed to be on my favorite team. As soon as I noticed that the date of the newspaper that Juan Epstein had brought me to was October 2, 1978, I scrolled to the sports page, and there it was: the Red Sox had tied the Yankees the day before, on the last day of the regular season schedule. A one-game playoff was set for that afternoon. I scrolled to the standings to see everything in perfect poise, the team I love tied with the team I hate. The playoff game and probable pitchers were listed in the upcoming game schedule below the standings. Ron Guidry that year was the best pitcher I’d ever seen, but I still had hope in Mike Torrez. There is one odd note amid the numbers on the back of Mike Torrez’ 1978 card. According to the information there, and compared to corresponding information on his 1974 card, Mike Torrez is in the process of shrinking. In addition to losing 13 pounds of weight, he has lost an inch of height, dropping from 6’6” to 6’5”. I wouldn’t have noticed this oddity upon finding this card in a pack. I would have been happy to find a player listed as a member of my favorite team, and I would have focused on all the wins. I might have found the doctored uniform slightly unsettling in a subconscious way, but I was not yet in the habit of tuning into omens of estrangement. It’s a given that I watched the episode of Welcome Back, Kotter on the night of October 2, 1978, as it was my favorite show at that time and I wouldn’t have had any other plans. Funny to think about plans for the evening of October 2, 1978. My world would have been leveled by then. In the episode, Juan Epstein and the rest of the Sweathogs—save for Barbarino, who by that point because of John Travolta’s growing fame had begun disappearing from the show (that individual disappearance the fatal beginning of the eventual disappearance of the show altogether)—attempt to talk a depressed girl off of a high ledge she has crawled onto with the intention of permanently disappearing. Is Mike Torrez looming? Is that what you’re telling me, universe? 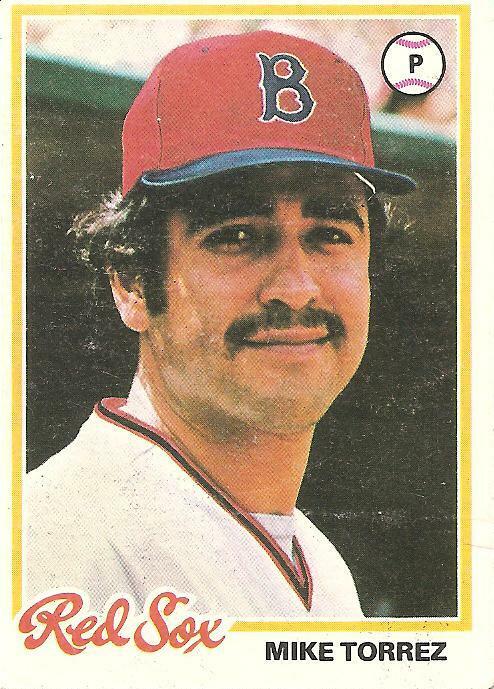 I go to Holland with my team on cruise control, enjoying a lead as big as any they’ve had since, well, since 1978, when the man pictured here was in his first season for the Red Sox. And I return home to find them sputtering and flailing. Minutes ago (yes, it’s a first on Cardboard Gods–a real-world, real-time update) the Red Sox lost another to the Kansas City Royals. Meanwhile, the Yankees have a comfortable late-inning lead. Where is this all going?Does anybody know anything about narrative therapy? I know next to nothing, but once a guy explained to me that it was based on the idea that we can change the stories of perpetual failure that we tell ourselves. Something like that. There’s more than just collapses, one bad thing giving way to the next, causing it, a snowball effect of doubt. Pesky holding the ball, Torrez serving up the homer to Dent, Stanley uncorking the wild pitch, Mookie Wilson pulling a grounder toward first. There’s more than all that. There are other possibilities. There is Millar drawing a walk, then Dave Roberts stealing second, then Mueller grounding one past a sprawling, finally human Rivera, Dave Roberts flying home to tie the score. There are stories that go that way and keep going: We’re alive! So even though I just got back from one trip I’m off on another, but this one’s a mission: I’m going to Vermont then on to Fenway for Saturday’s game. I hope to furnish a full report when I get back, and I hope it to be free of Torrez-ian gloom. You are currently browsing the archives for the Mike Torrez category.